The word ‘liturgy’ is taken from a greek word meaning ‘work on behalf of people’. In the context of the Mass, it means ‘the work of the People of God’. In this part of the celebration, as in every other, what is asked of us is active participation. 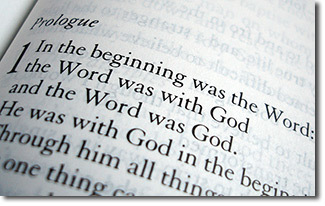 The Liturgy of the Word begins with the First Reading and continues until the end of the Prayer of the Faithful. To a certain extent the way we’re encouraged to participate may be obvious: when the readings are read, we listen; when the prayers are read, we pray. However, the connection between the two might be less clear. Imagine two neighbours talking to each other over the garden fence. Imagine them both talking at the same time whilst looking towards the bottom of their respective gardens. Perhaps they each hear bits of what the other says, perhaps they don’t. If you’ve never seen this kind of ‘conversation’ it may seem far-fetched. It might be rare, but it does happen. It should go without saying that in the Liturgy of the Word our model is quite different from that used by the two neighbours. If we’re prepared to listen, God speaks to us directly through his Word. We ponder what we hear and affirm it in the Creed. We respond with the Prayer of the Faithful. The Liturgy of the Word is to be celebrated in such a way as to promote meditation, and so any sort of haste that hinders recollection must be clearly avoided. Even if you’re very smart, having the First Reading, Psalm, Second Reading, Gospel and then the Homily in quick succession makes it very difficult to take in the many words. We’re called to affirm and respond to the readings and the homily, but without time to ponder that’s very difficult to do well. Therefore the General Instruction of the Roman Missal asks us to have brief times of silence after the First Reading, the Second Reading and the Homily. Time to meditate on what we’ve heard, and time to prepare a response. It’s a call to approach the Scriptures with the reverence they deserve. As the General Instruction says, “When the Sacred Scriptures are read in Church, God himself speaks to his people, and Christ, present in his own word, proclaims the Gospel” (29) .